Greetings Elmont Memorial Class of 2008! It is Time for Our 10th Class Reunion! Can you believe 10 years have passed?! It seems like just yesterday that we were making beats on cafeteria tables, walking around the gym with sweatpants on top of our jeans and driving around Long Island throwing toilet paper (and eggs) at teachers’ houses!!! The class reunion will be a great way for all of us to get together and catch up. With social media, we may know about milestones in one another’s lives, but nothing can compare to meeting up in person for fellowship and fun! Moreover, this reunion will also give us all a chance to walk the halls that we once did. The school is very different now and I, for one, would love to take a tour to see all the updates. 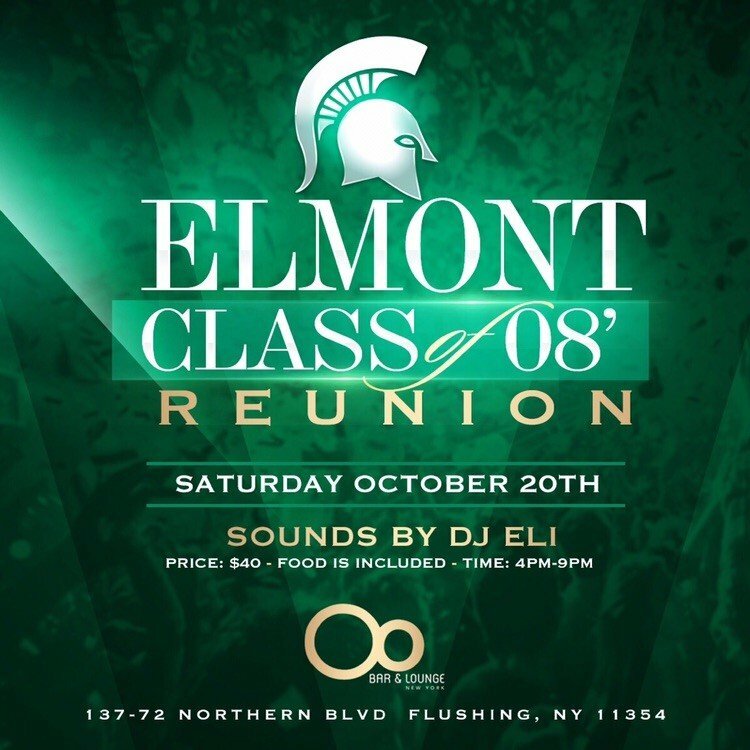 The celebration will begin on October 20th during Elmont’s Homecoming game, continue with a tour of the new and improved Elmont High and end at OO Bar & Lounge in Flushing for some food and drinks. Please register before September 30th to get the early bird discount. Ticket prices will go up starting October 1st. We are hoping for a great turnout and look forward to an amazing class reunion. Many classes before us have tried and failed to put on a successful 10-year celebration. This is our chance to show everyone how “Oh Gr8” we really are! Mark your calendars today, and plan to join us all in celebrating our lives, then and now. We will keep you updated and excited as the reunion draws nearer. In the meantime, please refer our classmates to join our Elmont Memorial Class of 2008 Facebook page and follow @ElmontAlumni on Instagram. If you have any suggestions or ideas for the class activity please contact the EAGLES Alumni Group at ElmontAlum@gmail.com.